Picture the scene: You've been stuck behind a slow moving lorry for over ten minutes, there's a gap in the oncoming traffic so you nail the accelerator. The only problem is, there is also a motorcycle approaching at speed from the opposite direction and you haven't seen it. But the scene that follows isn't one of death and destruction; because miraculously, the car you are driving could 'sense' the motorcycle from a mile away and quickly applied the brakes to avoid a horrific accident. 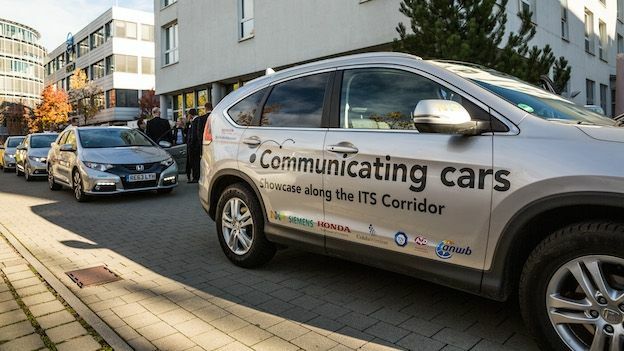 This isn't some science fiction fantasy but the utopian future that Honda, Siemens, Cohda Wireless and semiconductor manufacturer NXP hope to realise in the coming years with the introduction of an Intelligent Transport Systems (ITS) Corridor - or smart road - that spans Germany, Austria and the Netherlands. The intelligent highway will act as a test bed for specially developed chip technology that will not only allow vehicles to communicate with one another but also with the landscape and road furniture around them. The notion of autonomous motoring is nothing new but the next generation of self-driving vehicles won't get very far unless they learn to communicate with the roads and traffic around them. That's why semiconductor manufacturer NXP has teamed up with Siemens, Honda and wireless technology manufacturer Cohda to create an affordable comms solution that can be easily rolled out to manufacturers and infrastructure across the globe. The tech behind the idea is packed into a tiny chip that lives inside vehicles and is embedded into smart roadside furniture such as traffic lights, pedestrian crossings and variable speed limit signs. These chipsets, which can easily fit in the palm of your hand, communicate with each other over a bespoke automotive Wi-Fi network derived from the ones we use everyday on our computers. In short, all manner of data can be shared between vehicles and the road itself, which could lead to a drastic reduction in road traffic accidents, decreased CO2 levels and effective traffic management in busy cities that could decrease the number of snarling jams we have all become accustomed to. The main benefit of using Near Field Communication in the automotive world is that vital information can be shared instantly and over much greater distances without relying on - and clogging up - the relatively slow mobile networks. "The current radar and camera technology on today's cars can only see obstacles and problems directly ahead or behind the vehicle, it can't see a potential hazard around a corner," explains Lars Reger, VP of Research and Development at NXP. "Our chips can sense that a group of school children is about to cross the road half a mile ahead, meaning the car can warn the driver and even intervene if necessary. There is no delay in the passing of vital information," he adds. In the future, smart traffic lights featuring this tech could change their phasing to improve the flow of traffic, give priority to chip-enabled buses and even stop traffic should an emergency vehicle approach the area. But hackers keen on messing with the system will be disappointed, the technology features the latest encryption coding, meaning the messages are almost impossible to replicate or interfere with. "There will be a time in the not so distant future when the vehicle is quite simply more intelligent than the driver," explains Sven Leonhardt, Automobile Functions Manager at Honda. "We are still deciding how autonomous driving will work in the future but there's no denying that with car to car communication, vehicles will process more information than a human ever could," he adds. The rather bleak example of the doomed motorcyclist mentioned above is one that Leonhardt and his team are keen to explore. Even if a vehicle, such as a Honda motorcycle, isn't sophisticated enough to boast autonomous emergency braking or automatic steering, it can still benefit from sensor technology. "If the motorcycle has a chip embedded into the bodywork, it means it is visible to any car on the road featuring this technology. Other enabled smart vehicles will be able to see it from up to a mile away and react accordingly," he adds. Honda hasn't quite committed to pairing this tech with autonomous driving features, so the test run we experienced showed off the chip's sensing abilities rather than the car's capacity to react to dangers. During the short spin around the block, we were shown how a screen could alert the driver of a pedestrian crossing ahead, upcoming slippery road conditions and slow vehicles in the road. The system let out a loud beep when it received information from the deliberately placed road furniture ahead, often a long time before the human eye could react to such a danger. The experience wasn't exactly mind-blowing but the technology works and the potential is huge. Is this the end of the boy racer? Theoretically, it could be. If automotive manufacturers decide to couple this chip technology with intrusive autonomous safety features, it could easily see the end of 'spirited' driving in built-up areas or known danger hotspots. But when posed with this question, Leonhardt was keen to point out that Honda is about to release a potent Civic Type-R and it wouldn't make sense to manufacturer cars of this kind that can't be driven the way nature intended. "Ultimately, it is up to the government to decide if this sort of passive safety technology is rolled out. Just like the safety belt, we could see it become mandatory over time but at the moment we want to offer these system to assist and help the driver in the right circumstances," he adds. In reality, the technology will first appear as an option on upcoming vehicles and will likely make the biggest impact in urban areas where traffic rarely troubles the 30mph speed limit anyway. The study is still very much in its infancy and the technology currently on display is unlikely to impress those driving vehicles that are already fitted with advanced traffic sign recognition cameras, but the potential is clear. "Previous studies have shown that by simply having this system in place, motorists adopt a safer driving style. But if more vehicles sign up and the infrastructure improves, we could easily see a 30 per cent reduction in road fatalities," explains Lars Reger of NXP. "Not only that but local governments could save a fortune on building new infrastructure when adopting a smarter system could do the job for less and more effectively," he adds. Intelligent roads are most certainly coming and they undoubtedly will help shape the future of autonomous driving, which leaves just one question: who is going to pay for it all?